Want to feel like a Sunday River local? Read this quick overview about the resort’s local geography and weather patterns and you’ll be on your way. 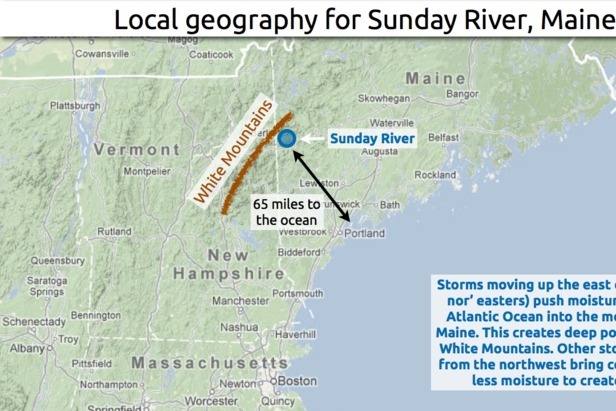 Sunday River is located in western Maine only five miles from the New Hampshire border. This location puts it at the northeastern edge of the White Mountains. The highest point in New England is in the White Mountains and lies only 23 miles to the southeast. This mountain is called Mt. Washington and it tops out at 6,288 feet. The summit of Sunday River is much lower at 3,140 feet, though this still provides a vertical drop of 2,340 feet to its lowest point at the base of White Cap mountain. This single ski area is actually divided into nine interconnected mountains that provide 743 acres of trails. However the mountain skis much bigger as Sunday River has a “Boundary-to-Boundary” policy that allows guests to ski any off-trail area within the ski area boundary. Two main storm tracks bring snow to this part of Maine. The most difficult storms to forecast are called Nor’ Easters and track from south to north along the east coast of the United States. While the weather forecasting computer models are often able to predict that these storms will develop, the exact track of the low pressure is usually uncertain until the last minute. If the center of the storm tracks close to the coast and heads inland, then warm air can be drawn into the storm from the Atlantic Ocean and this can bring rain to many areas. However if the storm stays just far enough offshore, it’ll create deep snow with the perfect mix of moist air from the ocean and cold air from the north. 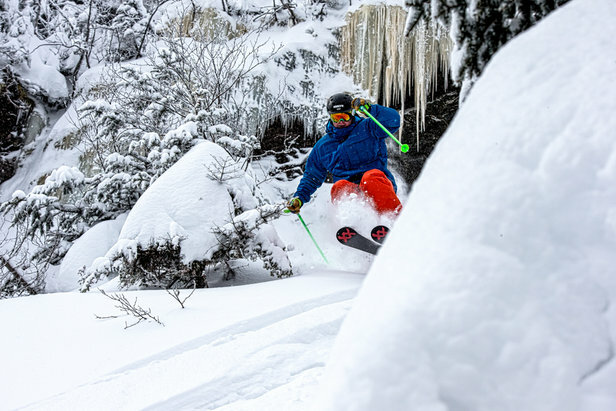 Find the powder like a local at Sunday River. The second type of storm usually comes from the west or northwest. With origins in the drier and colder regions of Canada, this storm track doesn’t produce the high snow totals that a Nor’ Easter can bring, but the cold air does ensure that light, fluffy snow is the predominant type of precipitation. 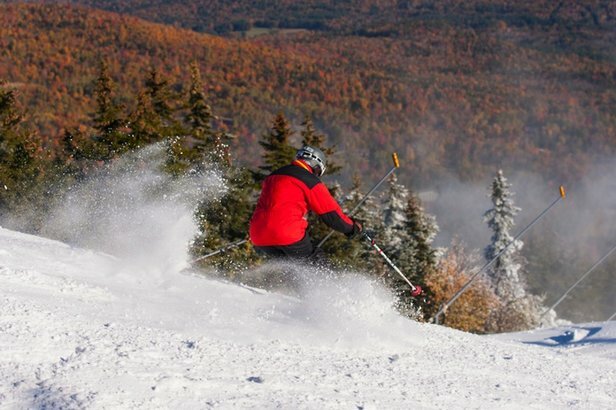 An average season brings 167 inches of natural snow to Sunday River, but this is just a bonus. With one of the nation’s largest snowmaking systems, coverage is rarely an issue. This system covers 83 percent of the terrain with 1,900 snow guns. Even more impressive, with a water-pumping capacity of 9,000 gallons per minute, the machines can cover four acres with a foot of snow every hour. Now that you know the local geography, weather patterns and how snow is made at Sunday River, the only thing left to do is enjoy your day on the hill. Learn how to predict the weather like a Stowe Mountain Resort local using these tips from Meteorologist Joel Gratz.